On Tuesday, March 7th, AIC welcomed Summer Nasser to AIC’s Community Forum. She discussed the humanitarian crisis in Yemen, one that is getting little attention. Yemenis are experiencing famine and war. Humanitarian efforts, such as medical aid, food, etc. will assist those in need. Nasser called on the group to raise awareness of the situation plaguing Yemen. We thank Summer for speaking on this important cause. Almost 2 years of conflict in Yemen, the nation is now classified as the world’s worst humanitarian disaster. Over 28 million people are suffering from lack of food, medical supplies and basic needs. Without an end to hostilities, a ceasefire or political solution and immediate relief, the situation will continue to worsen. Summer has experienced both the street wars of Aden and the air strikes on Sana’a in the recent conflict in Yemen. 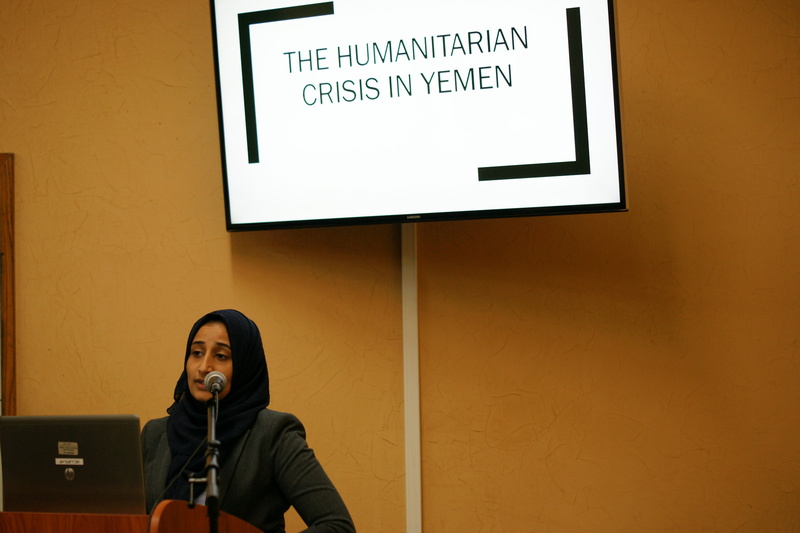 She has written five publications, including two on Abyan refugees, and recently spoke along side Yemen’s Ambassador to the UN about Yemen’s humanitarian crisis. Summer is a recipient of the 2013 Peace Envoy, awarded by Turkey-based Intellectual Association.